So, wisely Netflix has decided to upload a crisp HD version of the trailer for this. Do ignore the rest of this post, and just enjoy splendid new HD Fincher imagery with just the right level of dark. Fantastic! 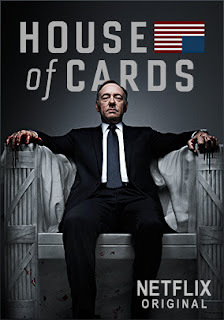 So the wild web went crazy today with a new trailer for HOUSE OF CARDS being released on Netflix, by Netflix — to a Netflix subscription-only audience. While I seriously find this a very flawed business logic, there may be even more difficulty in viewing the trailer as commenters on several sites have indicated. It seems even with a Netflix membership you cannot view the trailer. You must be an actual subscriber. Then also the international crowd gets left out, as Netflix is a U.S. exclusive service — which I suppose is fair enough, as the show will air exclusively on Netflix. So why tease you foreigners with something you ain't seeing anyway. Now that would just be cruelty (visually compelling cruelty, I'm sure). At any rate, if you belong to the lucky leftover crowd that can actually see this: I hope you find it very enjoyable. Uhm. but do drop an opinion about it below, it would be greatly appreciated by the rest of us. And Netflix: Seriously, can we get this on Youtube? It's a damn commercial for all sakes! Netflix has just been released in Sweden, I saw the trailer here and it looks good! I'll see if I can rip the trailer off their site and post it elsewhere. Thank you very much Alexander!! You made my day, Alexander, but seriously! Hej Hej! Tack Alexander! Seems somehow kind of fitting that there should be Swedish subtitles over this, don't you think? Fincher just can't shake off Sweden! Trailer looks excellent. Much tack! I've watched it like 5 times :) , it really looks like a great show. It does have this Zodiac/Dragon Tattoo vibe... But when I saw Spacey talking straight to the camera, my first thought was: Fight Club ;) Awesome! Beautiful. Fincher at his best. Classic Fincher. Sublime shallow depth of field, some stunning focus pulls, precise camera placements and movements; gem after gem after gem. Watch the shot @0:35 ~ shimmering split screen blue/gold lighting, focus pull from foregrounded Spacey to the background doorway, with the guy holding the door open on the right of frame perfectly reflected in the dark blue marble on the left of shot. Or the shot @1:51 of Spacey smoking blue at the night window ~ fantastic! And all smothered in a delicious foreboding. By the way the spoken asides to camera were an integral part of the original BBC series with the great Ian Richardson. But they can't help but bring 'FC' to mind. You HAVE netflix in the UK, idiot! As usual perfectly framed and familiar photography. Too bad Spacey overacts (as usual). We'll see. Meh. We'll find this on torrents on day one.